If you use your Teflon or non-stick pots and pans on a daily basis, you may unknowingly be exposing your family to hidden dangers. That's because non-stick cookware is made using a carcinogenic chemical called perfluorooctanoic acid (PFOA), which starts emitting toxic fumes that you inhale every time you cook with a non-stick pot or pan! However, the Bengaluru-based Hairline International after initiating research has started to build awareness among Indians on the use of Teflon products and its harmful effects. The centre is now getting the Government of Karnataka involved to fund the project and also likely ban on Teflon products in the state. Research indicated that at high temperatures, the coating of non-stick cookware will also break down into a chemical warfare agent known as PFIB, and a chemical analog of the WWII nerve gas phosgene. Teflon has been in commercial use since the 1940s. It has a wide variety of products used in clothes, food and even water because it is extremely stable (it doesn’t react with other chemicals) and can provide an almost frictionless surface. Most people are familiar with it as a non-stick coating surface for pans and other cookware. It is also used in many other products, such as fabric protectors. Hairline International Research and Treatment Centre released a report on the effects of Teflon that contains Perflurooctanoic Acid (PFOA), on hair fall. 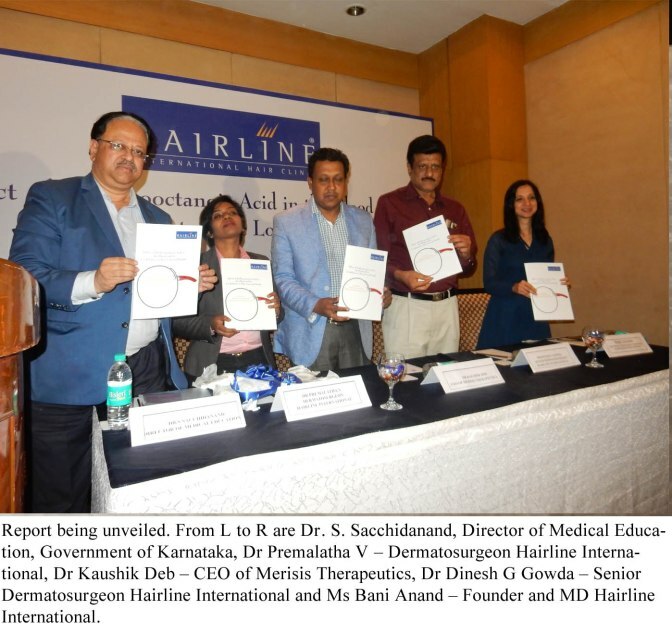 The report was released by Dr. S. Sacchidanand, Director of Medical Education, Government of Karnataka. In this recently concluded study, it was proven that 80% of the cases visiting the clinic with hair fall are PFOA positive. What is alarming is that of these cases, 65%, irrespective of gender developed high cholesterol. 70% of the women developed Polycystic Ovarian Disease (PCOD) and 65% developed hypothyroidism. Speaking on the release of this research, Dr. Sacchidanand said, “There are a number of products we use on a daily basis thinking that they are good for our health and lifestyle. However, research such as the one released by Hairline International today shows that there is a need to examine such products and substances in depth to truly understand their impact on us in the long run”. Dr. Premalatha V, Dermatosurgeon, Hairline International Research and Treatment Center says, “We have routinely carried out numerous researches on the various elements patients are exposed to and their possible connection to hair loss. Teflon (PFOA) is a commonly occurring element in households and even in water, and we found it important to look into its connection with hair loss. This research provides a new approach to dealing with hair loss and looks beyond known causes usually found in textbooks. This approach takes into account the new lifestyle diseases that are now afflicting people”. Bani Anand, Founder and Managing Director, Hairline International says, “Hairline’s research wing has, over the years undertaken numerous researches which have helped us enhance the medical management of hair and skin that we are dedicated to doing. Internationally, a number of researches have been conducted on the possible harmful effects of PFOA and it has been found to have negative effects. This research helps us understand how an everyday element can wreak havoc on hair and how it may be countered”. Teflon coated pans are a common occurrence in most home, especially considering that these products are marketed for the health conscious. One of the substances it comprises is PFOA. Most of the fast food packaging as well as candy wrappers and pizza box liners contact food contact papers that have traces of PFOA in them. PFOA has also been found in industrial waste, stain resistant carpets, carpet cleaning liquids as well as in house dust, microwaveable popcorn bags, food and water. Once ingested in humans, PFOA has an average elimination half-life of about 3 years. There are also reports that have shown in animal based testing that there is a connection between PFOA and the occurrence of bladder, colon and prostate cancer. Hairline International has conducted an observational study across 6 centres of the organization for a period of one year from October 1, 2015 to October 30, 2016 to understand the effects of PFOA in the blood and its correlation to hair loss. 500 cases and 500 controls were taken for the study. A detailed history was taken of each the cases to understand their lifestyles and the number of times they use non-stick cookware in a week. It was seen that 401 out of the 500 cases (chosen from the urban areas) examined tested positive for PFOA in the blood. These results were primarily from the age group of 18 years to 44 years and those working professionals who were regular in consuming food made in non-stick cookware at least 4-6 times a week. The 500 controls, on the other hand, were Bengalureans from lower strata of society- mostly physical and manual labourers, who used earthen pots and steel or aluminium cook ware to cook or warm their food. Only 15 subjects were found to be PFOA positive. The study thus concluded that 80% of the cases visiting the clinic with hair fall are PFOA-positive. High PFOA levels leads to a higher incidence of PCOD, hypothyroidism, and high cholesterol, all of which indirectly cause hair fall. Further studies are needed to clearly identify clinically meaningful aspects of PFOA-associated hair loss. Larger studies may be required to draw definitive conclusions.